This is a great choice for eco-conscious travelers. 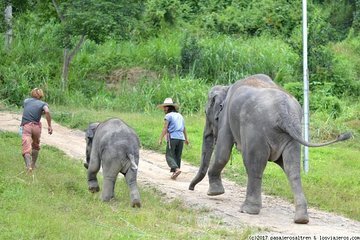 Go on an ethical tour in Phang Nga, where you’ll visit an elephant jungle sanctuary that cares deeply about animal welfare and lets the elephants roam freely. Round-trip transfers are included, so you won’t have to worry about navigating, and a guide enhances the tour with commentary about elephants, and anecdotes about their personalities. Once you’ve worked up an appetite, a tasty lunch is provided.